The renowned record label and lifestyle company Putumayo World Music presents a unique exploration of the music and culture of Peru, one of South America's most fascinating and diverse countries. The bustling and colorful capital city Lima is the epicenter of Peru's artistic community, and Putumayo's in-house ethnomusicologist Jacob Edgar along with local expert Alvaro Fernández will guide you to some of their favorite historical, creative, culinary, and, of course, musical hotspots. Over eight days, you will enjoy exclusive performances and meet-and-greets with some of the country's most important musicians and discover the vibrant rhythms and enchanting melodies of the Andean and Afro-Peruvian sounds that make up Peru's eclectic musical landscape. On this unforgettable journey, you will also explore Peru's distinctive cuisine as well as Lima's impressive architecture, archeology and arts, and of course a visit to the legendary lost city of Machu Picchu, and the Andean town of Cusco. On arrival, you’ll be warmly greeted at the airport and where you will be transferred to Hotel Antigua Miraflores, located in the trendy district of Miraflores in Lima and just a few blocks from the ocean-view cliffs of the malecón. After breakfast at the hotel, we'll gather for introductions and a tour orientation. Then, we will have a guided tour of Lima's historic colonial city center. From there, we will head to Museo de Larco, deservedly Lima’s most renowned museum with one of the world’s largest collections of stunning pre-Columbian art. We then return to Miraflores for lunch at Huaca Pucllana, whose patio overlooks Lima's most impressive pre-Inca pyramid. Our afternoon features an exclusive meet and greet and private concert with Susana Baca, an international superstar and one of Peru's leading Afro-Peruvian voices. After dinner, those with energy left can join Jacob and Alvaro on a tour of the local nightlife. After breakfast at the hotel we'll meet up with Peruvian music superstar Lucho Quequezana, the country's most famous contemporary performer of music inspired by Andean traditions. A multi-instrumentalist, virtuoso and loveable charmer, Lucho will introduce us to the fascinating history, unique instruments and poignant sounds of Andean traditional music, while demonstrating his efforts to modernize and bring the music to new audiences. Lucho will join us on a tour of Barranco, Lima's most bohemian and picturesque neighborhoods, which is home to numerous boutiques, galleries, cafes and plazas. We will visit the Bridge of Sighs and learn about its important connection to Peruvian musical history. We will lunch at Isolina Taberna, whose fantastic ode to Peruvian home cooking will thrill your taste buds. After more exploration of the neighborhood, free-time for shopping and time to rest before having dinner on your own. Today we dive mouth-first into Peru's amazing cuisine. We start with a visit to a typical Peruvian market, where you can see firsthand the cornucopia of ingredients from Peru's diverse ecosystems. From exotic fruits and vegetables, a menagerie of sea food and unusual local delicacies (roast guinea pig, anyone? ), Peruvian cuisine surprises and delights. We will get a hands-on with a cooking class at Urban Kitchen, where we will learn the secrets of a great ceviche, Peru's iconic marinated seafood salad. This afternoon, we will explore Lima's coastal delights. After, we'll will meet up with members of Novalima, one of Peru's hottest bands, who will demonstrate their inspiring blend of Afro-Peruvian roots music with contemporary electronic beats. For dinner, we discover the unique flavors of the Amazon at Amaz, where chef Pedro Miguel Schiaffino's uses the bounty of Peru's lush rainforest region. After dinner, we will have cocktails and music with members of Barreto, a trend-setting band that has brought the enticing sounds of Amazonian psychedelic cumbia to mainstream audiences. After an early morning flight from Lima to Cusco, we'll head to the Cuper Children's School in Chinchero for an uplifting meet-and-greet with the children and an Andean Pachatusan music group. Afterwards, we'll dine lunch at the picturesque Tawa restaurant. Next, we'll board the train for a stunningly scenic journey to Aguas Calientes, also known as Machu Picchu Pueblo. Once here we'll spend the night at the Inkaterra El MaPi Hotel. After breakfast at the hotel, we will visit the legendary lost city of Machu Picchu. One of the Seven Modern Wonders of the World, this is a destination on almost everyone's bucket list, and for good reason. We will have lunch in the area, then return to Cusco by train where we will check in to the Hotel Casa Andina. During dinner at the Inka Grill, we'll enjoy an interactive performance by one of the region's top Andean ensembles. After breakfast at the hotel, we'll visit the colonial landmarks in Cusco including the historic city center, the Temple of the Sun, the archaeological complex of Sacsayhuaman, Kenko, Pucapucara, and Tambomachay, and the Plaza de Armas. Following lunch at Pachapapa, we'll experience a Pachatusan Spiritual Musical Ceremony led by Wachan Bajiyoperak, an authentic 'Harawico" who has inherited the wisdom and knowledge of the sacred sound from his Inka ancestors. Tonight, we'll have our farewell dinner in Cusco. 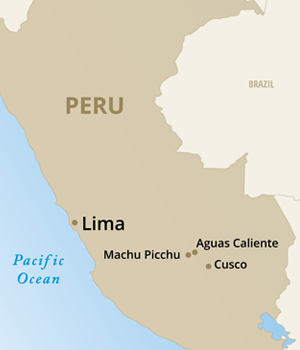 After breakfast, we'll depart Cusco for Lima and onward to your final destination. The Hotel Antigua Miraflores is an authentic introduction to Peru’s rich cultural heritage. Enjoy the elegance and character of a turn of the century mansion with all the comforts and amenities of a fine hotel. Chosen for its tasteful decor, attention to detail, and the staff’s attentive and friendly service will make your stay, in the heart of cultural Lima, unforgettable. Within walking distance of some of Lima's best restaurants and bars, the Hotel Antigua Miraflores, is the perfect home base to experience vibrant Miraflores. The Hotel Casa Andina Premium Cusco is strategically located a few blocks from the main square (Plaza de Armas) in the city center and is ideal for exploring Cusco. With only 93 rooms guests are treated to attentive service. Each room is designed around colonial-style courtyards with wooden balconies complete with updated and modern amenities inside. The gourmet Alma Restaurant and Bar features fresh Sacred Valley produce and Andean specialties and serves drinks on the terrace. Free WiFi access is available throughout the property. Step into the smart, contemporary and cozy confines of El MaPi, amidst the picturesque Machu Picchu Pueblo. Discover an efficient, lively and friendly atmosphere, welcoming guests when they return from they daily excursions. The flowing lobby creates a sense of vitality. Lofty ceilings, panoramic windows and an open café allow natural light to filter between tall eucalyptus dried branches, creating an ambience of order and wellbeing. **Not included: Gratuities for guides and driver are left to the guest’s discretion and should be based on your satisfaction with the level of service received. SINGLE SUPPLEMENT: For single-occupancy pricing, add $725.